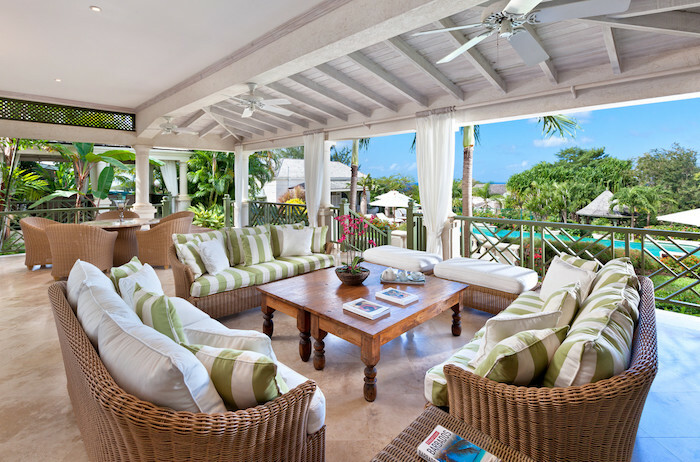 A most prestigious colonial style Caribbean holiday villa located in the exclusive Royal Westmoreland resort, with stunning views across the golf course to the turquoise blue of the Caribbean Sea. The Westerings sits in an elevated position on the 13th hole of the resort’s championship golf course designed by Robert Trent Jones Jr. The master bedroom and second bedroom on the ground floor have kings size beds. Two more bedrooms upstairs have king size beds and one has twin beds. The cottage bedroom has a double bed. The master bedroom is only included in the full 6 bedroom rate. The six bedroom rate will allow up to 14 guests, including small children. Guests have access to on-site tennis, golf and a fully equipped gym as well as use of the house golf buggy. In addition, Royal Westmoreland has its own exclusive beach club at Mullins Bay with complimentary sun beds and towels and waiter service for drinks and snacks. There is a complimentary shuttle service from the Royal Westmoreland to and from the beach. For the tennis enthusiast this luxury home in the Sugar Hill Resort is surrounded by tropical landscaped gardens with a hot tub and swimming pool next to the dining pavilion, panoramic sea views, a private tennis court as well as access to the resort's tennis courts and gym. Set in mature and well groomed gardens on a prime double sized plot, this luxurious villa features exquisite furniture and quality finishes with ample outdoor areas for relaxing and entertaining and benefiting from the lovely breeze that keeps the villa nice and cool. Resort amenities include golf, tennis, gym, beach club and beach access.